The first trailer for Aaron Sorkin's feature directorial debut, Molly's Game, has arrived and I didn't need to see it to be sold on the fact I'm going to be excited to see this movie. Based on Molly Bloom's 2014 memoir of sorts titled Molly's Game: From Hollywood's Elite to Wall Street's Billionaire Boys Club, My High Stakes Adventure in the World of Underground Poker the film tells the story of Bloom who was once an Olympic-class skier who ended up running the world’s most exclusive high-stakes poker game for more than a decade before being arrested by the FBI. Bloom's tell-all about her exploits clearly informed Sorkin's screenplay and his interest in the material, but I'm curious as to what about Bloom's story made the famed writer want to take this on as his debut directorial effort. Given it was just announced Molly's Game will be having its world premiere at TIFF next month I will definitely be adding this to my list of must-sees given the film doesn't open until Thanksgiving and will likely be making a strong Oscar campaign for itself if it turns out to be even half as good as its credentials would imply. Providing yet another strong leading role for Jessica Chastain Molly will hopefully garner the actress the consideration she deserved for last year's underseen and underappreciated Miss Sloane (I still need to catch-up with Zookeeper's Wife). Chastain has the support of some strong and seasoned players here as well, but of course her strongest asset will likely be that of Sorkin's words and how he puts them into play as the film not only seems to have been adapted from Bloom's book, but what happened after the fact given the lawyer she is pitching herself to holds a copy of that book. We know Sorkin likes to play with structure as well as with the challenge of being able to essentially convey action sequences via that of long monologues that are anything but tedious. 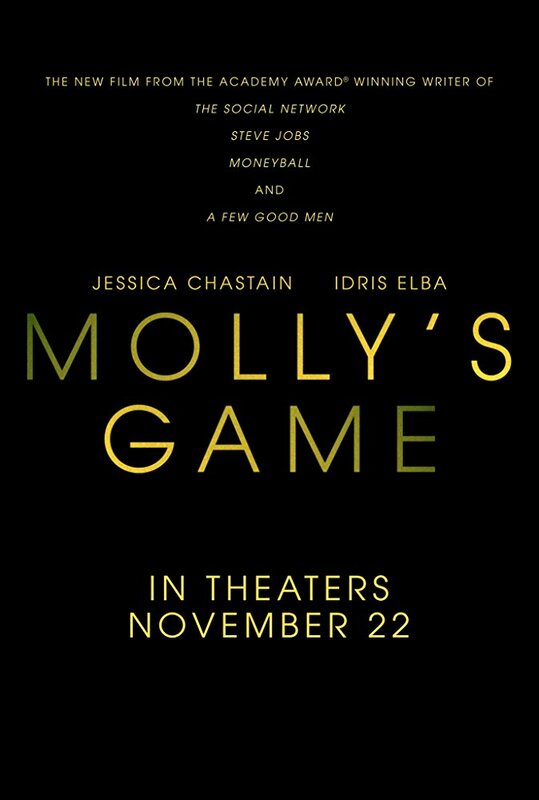 Steve Jobs was one of my favorite films of 2015 and for me, personally, The Social Network is still one of the best films of the last decade and so there is not only a level of excitement, but a level of expectation to Molly's Game that I certainly hope Sorkin can meet. I'm ready. Molly's Game also stars Idris Elba, Kevin Costner, Michael Cera, Jeremy Strong, Chris O’Dowd, Graham Greene, Brian d'Arcy James, Bill Camp, and opens on November 22nd, 2017. Synopsis: MOLLY’S GAME is the true story of Molly Bloom a beautiful, young, Olympic-class skier who ran the world’s most exclusive high-stakes poker game for a decade before being arrested in the middle of the night by 17 FBI agents wielding automatic weapons. Her players included Hollywood royalty, sports stars, business titans and finally, unbeknownst to her, the Russian mob. Her only ally was her criminal defense lawyer Charlie Jaffey, who learned that there was much more to Molly than the tabloids led us to believe.